There’s obviously no rest for the wicked. No sooner than I finish fixing for the BBC and Al Jazeera English on what most outside observers consider to be a historic agreement between Armenia and Turkey to normalize relations after almost a century of bitter rivalry, than Tbilisi beckoned in the form of a New Media Forum. Not only that, but waiting for me on my return was The Wall Street Journal and another fixing gig on what is arguably the main story coming out of the region this year. Interestingly, despite some concern about the possibility of large scale protests against the agreement in Armenia, there continues to be little visible opposition for now, at least. 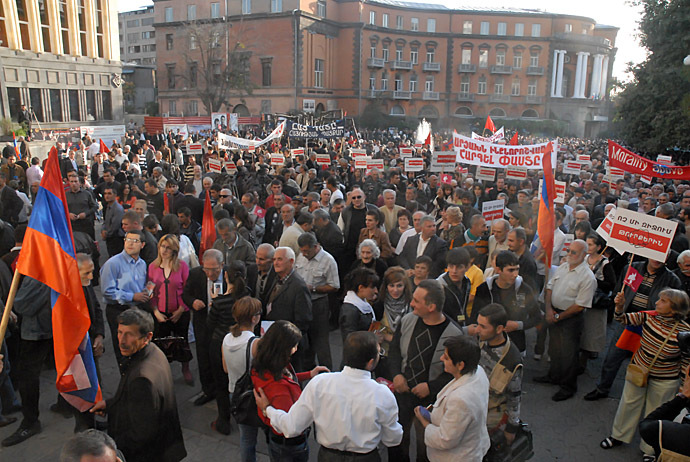 The main nationalist Armenian Revolutionary Federation — Dashnaktsutyun (ARF-D) have even called off their round-the-clock strike against the agreement and a rally held on Friday failed to attract more than a few thousand. Indeed, while RFE/RL estimates more than 2,000, others put the figure at less than 1,500. 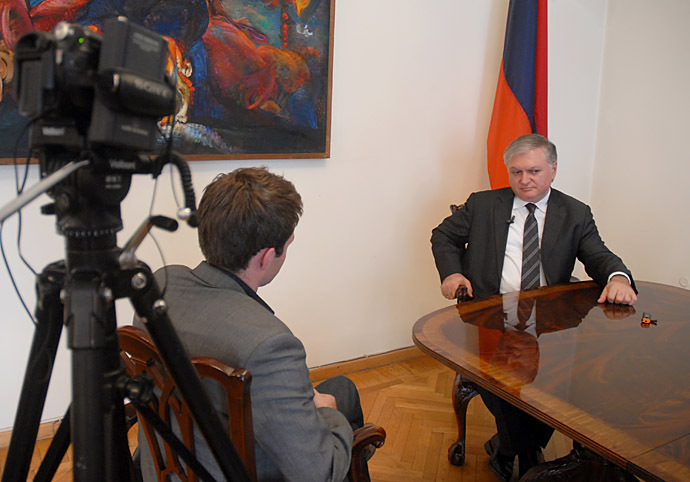 Indeed, Armenian Foreign Minister Eduard Nalbandian appears confident even with calls for his resignation. Moreover, the traditional extra-parliamentary opposition argue that the ARF-D cannot be taken seriously until it sets its sights on unseating the president. 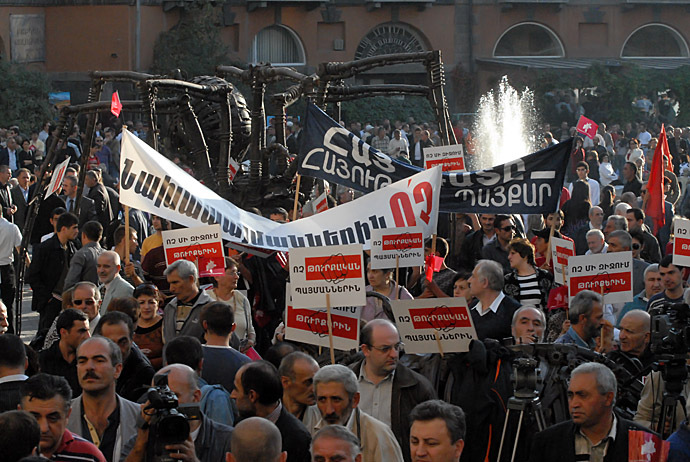 The Armenian Revolutionary Federation (Dashnaktsutyun) pledged to step up its campaign against the controversial Turkish-Armenian agreements but again refrained from demanding President Serzh Sarkisian’s resignation as it rallied more than two thousand supporters in Yerevan on Friday. Leaders of the hard-line opposition party stressed that they will seek to unseat Sarkisian only if they fail to prevent the agreements’ ratification by the Armenian parliament. The crowd chanted "No! No!" and waved banners saying "No concessions to the Turks" as they and leaders of several other opposition parties reiterated their strong condemnation of the deal. 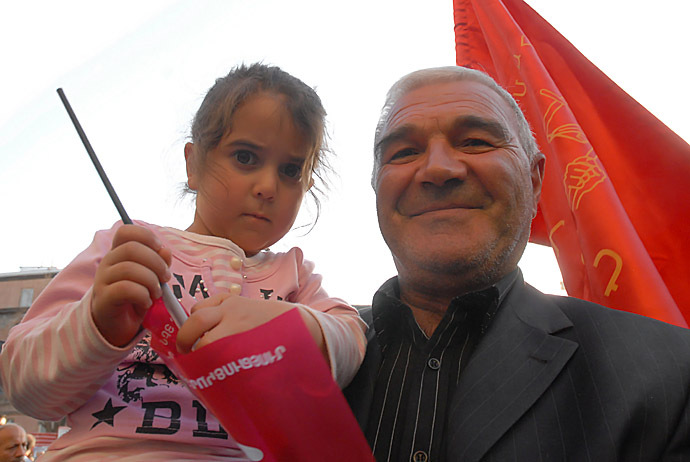 Only one speaker, Stepan Safarian of the Zharangutyun party, directly attacked the Armenian president, saying that his ouster is "one of the possible ways out of this situation." Virtually all other orators singled out Prime Minister Tigran Sarkisian and Foreign Minister Eduard Nalbandian for criticism. 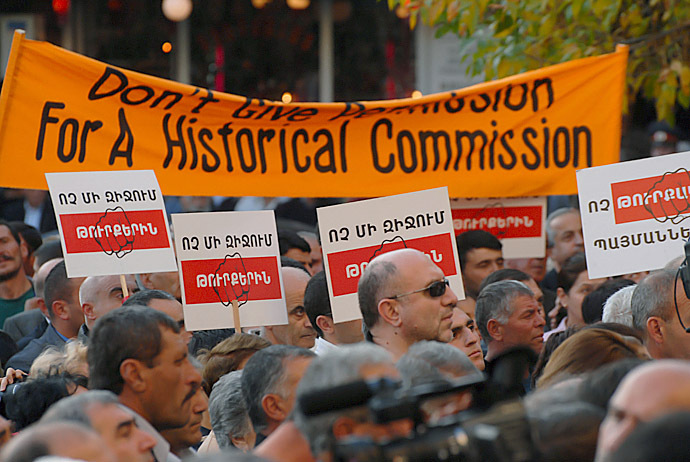 Meanwhile, although it is impossible to gauge the majority view of the protocols by Armenian society, those voicing their opposition to them face an uphill struggle. As one newspaper notes, the ARF-D seems reluctant to push for regime change while the extra-parliamentary opposition would appear disingenuous if it tried too hard to exploit concerns about the signing to achieve the same. In fact, one more moderate opposition paper spells out the situation even more directly, and especially with regards to the extra-parliamentary opposition’s hopes of using concerns about a possible connected deal with Azerbaijan to end the Nagorno Karabakh conflict. 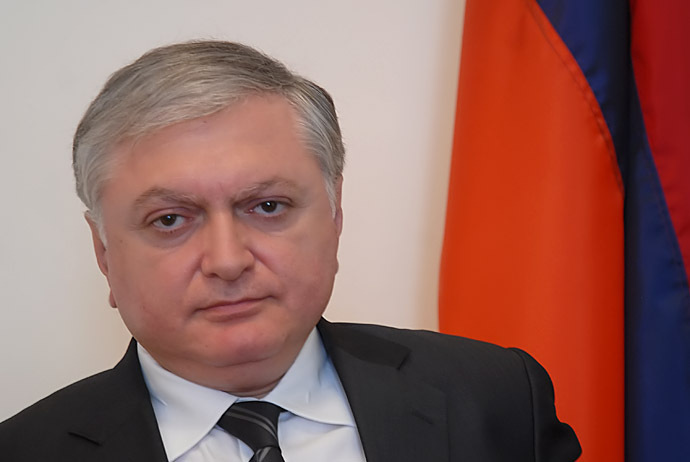 For now, Nalbandian says that all efforts are on ensuring that the Armenia-Turkey protocols and a Karabakh resolution are not connected. That said, many hope that normalization of relations with Ankara might assist resolution. For now, neither Ter-Petrossian’s extra-parliamentary opposition or the ARF-D appear strong enough to prevent the Armenia-Turkey protocols from being ratified by the Armenian National Assembly. Instead all eyes are on Turkey, which should present the protocols to parliament on 21 October. In Armenia, Nalbandian says the protocols will first be sent to the Constitutional Court, then to the President’s Office, and then to the National Assembly. 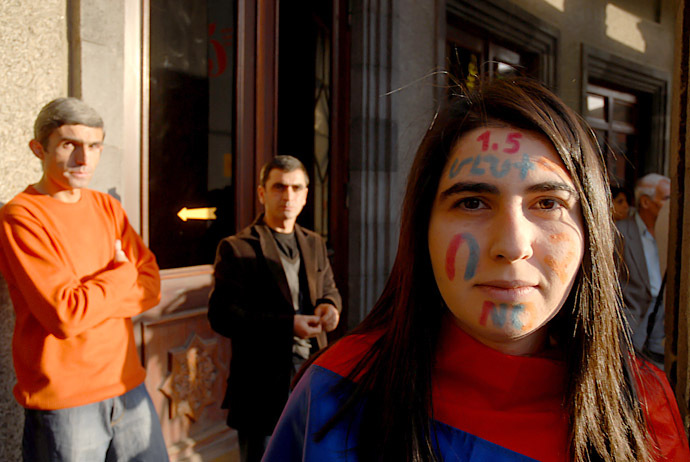 Observers believe if the Turkish parliament ratifies the protocols in a timely fashion, the same will occur in Armenia. However, some concerns have been expressed by analysts who fear Turkey might delay ratification although others such as The Independent see problems in other areas. Is the accord going to end decades of hatred? *Whatever the Armenian diaspora says, growing numbers of people in Armenia want to trade and travel. *Historians on both sides of the frontier are increasingly determined to query ‘official’ versions of history. *Turkey knows it cannot advance its EU hopes while relations with its eastern neighbour are frozen. *Nationalists in both countries are determined to prevent reconciliation and will lobby their two parliaments. *Even if the two assemblies do ratify the agreement, it will do very little to undo decades of mutual animosity.